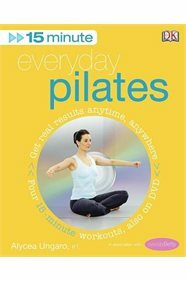 "If you want to get a toned, strong body and graceful posture but don't have the time, find out how following this Pilates book and DVD set. Forget gyms, expensive kit, and hours of punishing fitness regimes; try these easy-to-follow 15 minute Pilates routines and get your body tip top in no time. Clear at-a-glance fold-out pages show you exactly what to do and the live action 60 minute DVD demonstrates each of the four key exercises so you can master techniques. A total fitness package - exercising at home has never been easier or quicker! Created in collaboration with the popular boutique chain Sweaty Betty, with a foreword from its founder Tamara Hill-Norton."